This month’s Point of the Spear comes from different excerpts of works by Chairman Omali Yeshitela. The first excerpt is from his latest book, “Vanguard: the Advanced Detachment of the African Revolution,” Chapter Two ‘Our Party solved the problems of the revolution,’ pages 57-58. The second comes from the pamphlet ‘Black People and the U.S. Economy: Our Case for Reparations,’ pages 85-87, written in 1982. These excerpts are to show the Party’s work in advancing the question of reparations—taking it out of the courtrooms and university halls, to the African working class colony. The Party launched a worldwide reparations movement in 1982, hosting 12 consecutive reparations tribunals, forming the African National Reparations Organization and growing the African People’s Solidarity Committee. It was we who took the reparations demand out of the straitjacket of purely legal and legislative approaches. We are the organization that gave the reparations demand a mass and concrete character. We deepened the theoretical and political basis for the demand and began the practical process of acquiring reparations that made it a reality and not just wishful thinking. When our Party began this work, the so-called reparations movement was only considering compensation for African colonial-slavery. It was we who recognized that the rate of exploitation of Africa and African people has grown greater since the formal end of our legal enslavement. The existing reparations movement of today bears the imprint of the work of the Advanced Detachment of the African working class and forcibly dispersed nation. It bears the imprint of the African People’s Socialist Party. It was we who made the reparations demand a mass demand of our people. In 1982, we formed the African National Reparations Organization (ANRO). ANRO held reparations tribunals throughout the United States for 12 years. In fact most of the noted reparations activists of today gained their reparations involvement through a direct or indirect relationship to the work of our Party. Only the Advanced Detachment would be able to use the political device of international law and the Universal Declaration of Human Rights, giving the right of oppressed peoples to bring their case before the bourgeois world court. Only African Internationalism could inform us of the necessary conclusion that reparations are owed because of parasitic capitalism and our stolen labor, land and resources. Our understanding that the reparations demand is a function of the Revolution allowed the Party to open a serious front among the colonizer population. Through the reparations demand, we are able to win thousands of “whites” to conscious participation in the assault on white nationalist colonialism. For some, their introduction to active political life was and is in the reparations work created and led by our Party. The above excerpt briefly shows our Party’s engagement in the reparations struggle spanning nearly four decades. The next piece from ‘Our Case for Reparations’ written in 1982, shows how the African People’s Socialist Party deepened the world’s understanding of the demand beyond the crimes against Africans in the U.S. In 1982, the Party boldly proclaimed “Reparations now, an idea whose time has come!” Turning the largely debated idea into a reality. As distinct from those African misleaders who go bowing and scraping to the imperialist controlled International Monetary Fund and World Bank or seek loans and aid from the imperialist powers which come at the expense of our people's needs, that come provided African governments will cut back on “waste,” i.e., programs that mean the difference between life and death for millions of our people, the African People's Socialist Party demands that we be given what is ours. “We want the U.S. and the international European ruling class and states to repay Africa and African people for the centuries of genocide, oppression, and enslavement of our people. “We believe that U.S. and European civilization were born from, and are presently maintained by, the horrendous theft of human and material resources from Africa and its people. We also believe that this theft of human and material resources is responsible for the present under-population and underdevelopment of Africa and her people and the political servitude, material impoverishment and cultural discontinuity and disintegration of African people throughout the world. “We believe that Africa and African people are due reparations, just economic compensation, billions of dollars which must be paid to the Organization of African Unity or any other legitimate international organization of African people, for equitable distribution for the development of Africa. 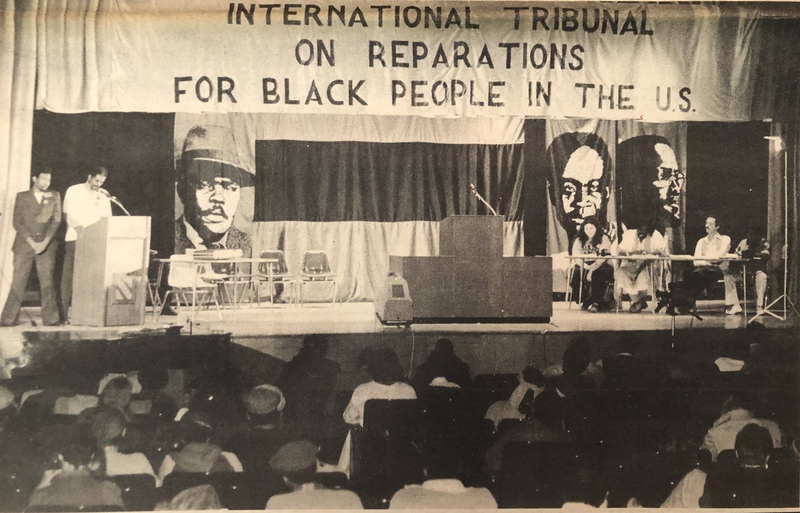 As a first step in this direction, the Party has initiated this November’s World Tribunal on the crimes of U.S. imperialism against African people in the U.S., a tribunal that will weigh the evidence against U.S. imperialism and render judgment in the form of reparations due [to] African people here. This campaign has a deep significance for African people as a whole and can help resolve some of the problems that stand in the way of African unity. Located in the center of imperialism, where “all the lines converge,” the campaign for reparations being organized by our Party offers the promise of being able to expose the real history of imperialist wealth and our own poverty, the real secret involved in this history, the real relations that are the product of that history and continually reproduce that history on new and more deadly levels, in a way that can strengthen our fight not only within the U.S. but in Africa and wherever African people are located. Afeni Shakur speaking at the first World Tribunal for Reparations: "What we have as our priority is first of all, we have got to know that we are fighting a just war." The demand for reparations is a demand of the African working class; it does not humbly plead to the reasonableness of the boss in a way that presupposes the right of that boss to exist; it does not ask for a few more crumbs for the handful while the masses are starving; it ruthlessly targets the very foundation of this system and demands back what is justly ours. It is a revolutionary demand of the African working class—for the leadership of the national liberation struggle of African people can only come from the African working class; the strategic leadership capable of educating people as to the basis of their oppression, that can actually take the initiative in the struggle against imperialism instead of moving from one futile defensive struggle to the next; such a role is reserved for the class which has no stakes in moving the people for any reason other than their complete and absolute liberation. But if it is a working class demand, this does not exclude any but the tiniest percentage of African people from taking up the demand and making it their own. “In the U.S.A., the Caribbean and wherever Africans are oppressed, liberation struggles are being fought. In these areas, the black man is in a condition of domestic colonialism and suffers both on the grounds of class and of colour...The total liberation and unification of Africa under an all-African socialist government must be the primary objective of all black revolutionaries throughout the world.” (Quote cited in the Party’s Political Report, The Struggle for Bread, Peace, and Black Power). This Tribunal and the campaign for reparations to come will take the struggle for African liberation into the very heart of imperialism. African revolutionaries the world over can strike mighty blows for African liberation by agitating, educating and organizing for its success.